Objective: Recently, we reported that stable-phase schizophrenia is characterized by two interrelated symptom dimensions: PHEMN (psychotic, hostility, excitation, mannerism and negative symptoms); and DAPS (depressive, anxiety and physio-somatic symptoms) and that Major Neuro-Cognitive psychosis (MNP) is the full-blown phenotype of schizophrenia (largely overlapping with deficit schizophrenia). Herein we examined the effects of immune activation in association with tryptophan catabolite (TRYCAT) patterning and memory disorders on PHEMN/DAPS dimensions and MNP. Methods: Serum levels of macrophage inflammatory protein-1 (MIP-1), soluble interleukin (IL)-1 receptor antagonist (sIL-1RA), IL-10, eotaxin, IgA/IgM responses to TRYCATs, and Consortium to Establish a Registry for Alzheimer’s disease (CERAD) tests were assessed in 40 controls and 80 schizophrenia patients. Results: Schizophrenia and MNP were predicted by significantly increased levels of IL-10, eotaxin and TRYCATs. A large part of variance in both PHEMN/DAPS symptom dimensions (42.8%) was explained by cytokine levels and TRYCATs combined. The MIP+sIL-1RA+IL-10 composite score and eotaxin explained each around on the basis of 19% of the variance in symptom dimensions, and approximately 18% of memory deficits. Moreover, MIP+sIL-1RA+IL-10 was significantly associated with elevations in picolinic acid, xanthurenic acid and 3-OH-kynurenine. Partial Least Squares path modeling shows that highly significant effects of MIP+sIL-1RA+IL-10 on symptomatology are mediated by the effects of noxious TRYCATs on memory deficits. 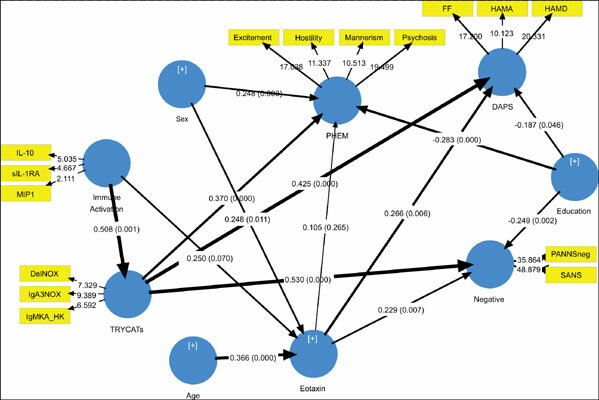 Conclusion: Current findings indicate that in schizophrenia, immune activation may underpin activation of indoleamine-2,3-dioxygenase and kynurenine monooxygenase, while impairments in episodic and semantic memory may be caused by the neurotoxic effects of TRYCATs and eotaxin. The combined effects of immune activation, eotaxin and memory defects determine to a large extent, PHEMN/DAPS symptoms and the MNP phenotype. These findings indicate that schizophrenia phenomenology is largely mediated by multiple neuro-immune pathways and that immune activation, increased production of eotaxin and neurotoxic TRYCATs (picolinic acid, xanthurenic acid and 3-HOkynurenine) are new drug targets in schizophrenia and MNP. Deficit schizophrenia, inflammation, cytokines, immune, oxidative stress, kynurenine.